In the words of the authors, "all four elevated CO2 concentrations (400, 800, 1200, 1600 ppm) were found to result in decreased stomatal conductance (26-86%), decreased transpiration rate (21-80%), increased water use efficiency (WUE) (10-412%) for [the] two Artemisia species and Caragana korshinskii." H. leave also tended to benefit from elevated CO2 in each of these parameters, but to a lesser degree than the other species (see, for example, the figure below depicting the WUE response of each species to elevated CO2). Given such favorable ecophysiological responses, Li et al. conclude that "plant exposure to elevated CO2 may partially offset the negative effects of increased drought due to their increased WUE and decreased transpiration." And that is great news for semi-arid regions like the Mu Us Sandy Land area of Inner Mongolia. Figure 1. 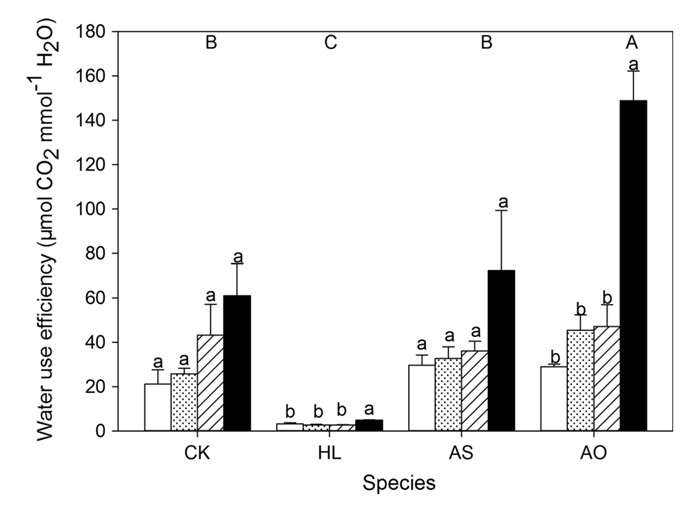 Water use efficiency (mean ± SE) of Artemisia sphaerocephala (AS), Hedysarum laeve (HL), Caragana korshinskii (CK) and Artemisia ordosica (AO) under different atmospheric CO2 concentrations (white column, 400 ppm; doted column, 800 ppm; hatched column, 1200 ppm; black column, 1600 ppm). Each bar represents the mean of three replicates; bars with different lowercase letters are significantly different from each other for same species under various treatments, and different capital letters indicate difference among species at P < 0.05 (Turkey' s test).